His Holiness the Je Khenpo consecrated a sacred relic or ringsel of Lord Buddha at Namdroling Goenzin Dratshang in Lhuentse yesterday. “It will remain as a sacred relic of dratshang and for the people of eastern Bhutan,” Tandin Sithup, the Khempo of Namdroling Goenzin Dratshang, said. The sacred relic was received at the dratshang in traditional chipdrel procession. 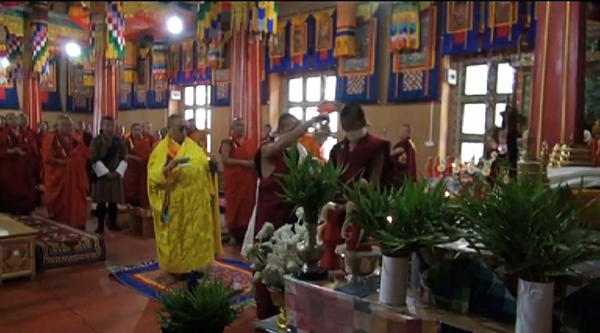 His Holiness offered butter lamp and prayers before the relic. In the afternoon, the relic was displayed outside the Lhakhang for the general public. Hundreds of devotees came to offer prayers and receive blessings from the relic. Meanwhile, His Holiness is also presiding over weeklong Drakmar Drupchen in the dratshang.